New Zealand, according to the gazetteer maintained by Land Information New Zealand has “249 named waterfalls and 31 named rapids”. There are perhaps seven named “Bridal Veil”, and 17 which include “Rere” meaning “to leap or descend”. In the North Island only 18 of 130 have non-Maori names (including 5 clustered around Mount Taranaki), but in the South Island only 15 of the 150 named waterfalls (or rapids) have retained their Maori name. There are disagreements on what constitutes a waterfall. For example, the Browne Falls is claimed by some to be a waterfall with a drop of 800 metres. Other sources describe it as a steep stream with numerous small cataracts. 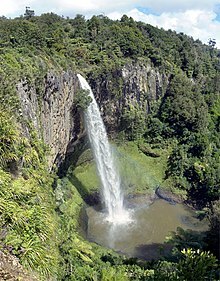 This is a list of notable waterfalls in New Zealand. Many of the highest waterfalls are in Fiordland. falls into Doubtful Sound - Chamberlain Falls, Helena Falls, Lady Alice Falls. falls into Milford Sound - Bowen Falls, Stirling Falls. ^ Kirkpatrick, pp. 128 and 130. Kirkpatrick, Russell (2011). Walks to Waterfalls: 100 New Zealand Waterfalls. Auckland: David Bateman. ISBN 978 1 86953 806 4. Cheng, Johnny T. (2006). A guide to New Zealand waterfalls (1st ed.). Artesia, CA: Story Nature. ISBN 9780976955191. This page was last edited on 6 February 2019, at 06:36 (UTC).